I'm happy to announce today the long overdue support for ARM based computers running Chrome. The best selling laptop on Amazon for the last several months has been the $249 Samsung Series 3 Chromebook. Starting today, all of NaClBox is available on this machine, and others like it. 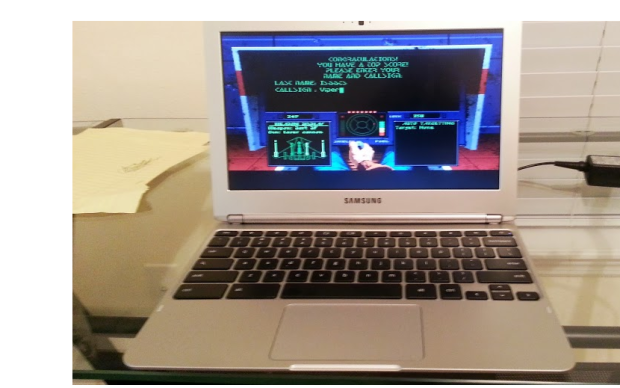 The games run surprisingly well on the laptop thanks to the amazing Google Native Client and DosBox. You can run classic games in emulation perfectly on these little laptops. I hope that modern games and apps that test the full capabilities of these new machines come to the web soon. It is difficult to predict the future, and there are many competing technologies that are trying to bring native experiences to the web. I've tried many of them and have been unable to (so far!) match the experience that Native Client delivers. Visit the game area and check out Epic Pinball, or Jazz Jackrabbit, or a demo of Secret of Monkey Island on whatever machine you run Chrome on (sadly, except, Android!). Everything works, including multiplayer space combat in Descent. If you have your own games that you want to run, check out My NaClBox, where you can host your games on our servers and play them in Chrome.